This paper is an excerpt from the original work known as Liminal Cosmogony, a body of teachings employed by the Lyricus Teaching Order. These teachings are the carefully chosen words and energetic transfers of Lyricus teachers, who have expressed them from an ancient, yet distinctly relevant voice. They are colored in our language and culture not because they are texts composed for our specific species or planet, but because all planets and their inhabitants evolve in a similar ascendant path, passing through transformative shifts to higher light and intelligence. Earth is passing through one of these corridors of higher dimensional light energy right now, and many of you are aware of this. This is part of your awakening and activation: to know that the earth is on an ascendant path, that this path includes you in a purposeful relationship, and that these new energies will restructure and realign the culture of humanity in profound and positive ways. One of these ways is a new intensity and focus of collective intelligence and empowerment. It is a goal of Lyricus to provide frameworks in which students of its works can empower themselves to be agents of spiritual awakening, align to the earth’s ascendancy, and assist earth and the beings upon her in this dimensional transition. This particular excerpt is focused on a technique called The Rising Heart. It is being released at this time because the energies of the Central Sun and the Teachers of Light are clearing a path to enable a stronger telepathic connection with those who desire this new empowerment. Those of you who have asked the Universal Creator or Higher Intelligence to activate your highest purpose; this paper, perhaps, is one of ITS responses. True to the standards of Lyricus, Liminal Cosmogony is not concerned with the cosmological ordering of the multiverse or the physics of time and space as they unravel into the void. The teachers of Lyricus are more concerned with the delicate human connection between the soul and the human instrument, and how this integration can be activated and its activation sustained amid third and fourth dimensional emotional turmoil, misinformation, mental static, and spurious electromagnetic fields, to name a few. Liminal Cosmogony is divided into seven sections. The excerpt provided in this offering is from the section entitled: “Teachers of Light.” Its knowledge is condensed into a mere 120 pages, focused on the techniques and behaviors of the sustainable spiritual perspective of a teacher of light embodied in a human instrument. It is designed to create empowerment in the student who studies it and applies its techniques and nuanced behavioral expressions. It is not for sale, nor is it freely distributed. It is given out in prescribed measures over time, and this offering—the Rising Heart—is the first. I have released the mythology of WingMakers as an initial stage of preparation for these higher dimensional works contained in Liminal Cosmogony. I have also provided the Lyricus website as the initial introduction to the voice of Lyricus teachers and our instructional approach. More recently I offered the Event Temples which will evolve into a foundation for quantum communities that will ultimately empower the Teachers of Light to orchestrate energetic transfers to the planet and its inhabitants (physical and non-physical alike). These are among the efforts of thousands of others who are also bringing the tools, techniques and technologies to empower individuals, and this offering is not meant to displace any of these, but rather to augment and support. The Teachers of Light are without affiliation to anything other than the higher light of the fifth dimensional field of unity. They are not beholden to any one system of belief, as they are collectively the system of knowledge in which they are rooted. The release of the more esoteric knowledge in Liminal Cosmogony signals a shift in the Lyricus Teaching Order to bring forward its technologies of inner light development for those who incarnated to be Teachers of Light upon earth. The Rising Heart will resonate with those who are prepared—who are already in the process of shifting their core consciousness to their heart’s crown and operating with internal coherence. My suggestion to each of you is to read and re-read this paper several times before you make any judgment as to its usefulness or application in your spiritual life. Then, use your intuition to guide your interpretation of the technique. The techniques of Lyricus are never spelled out in burnished detail; its teachers prefer to provide paradigms, concepts, and frameworks, leaving the precise implementation or blueprint to the individual. It is the singular initiation. The light body is awakening in literally millions of people on earth. As this blossoming of light occurs on the planet, there is an intuitive wisdom required to direct or channel this light or field of higher frequency energy. A higher ratio of light is not what is required, but rather a higher intelligence of light and love being applied to the right issues or problems that humanity faces. The light body reveals one’s inner light and wisdom. It is the vehicle of creativity that telepathically listens to the family of light and expresses its unique signature of insight in response to the family of light, adding dimension and nuance that deepens our interconnection and collective wisdom. The Rising Heart is a technique to help children of light to transition into teachers of light through their presence and behaviors, not because they can cite the esoteric nature of the human condition, articulate cosmological structures, or write the master keys of life. When you are drawn to this teaching you will feel a familiar resonance with the energetic frequencies contained in the words: “Rising Heart” and “Heart’s Crown”, as these are encoded words within your deepest being. The teachings of Liminal Cosmogony are encoded to integrate and align the harmonics of your light body with the time-space quanta of your human instrument. They weave the soul and mind-heart-body triad in temporal union so you can transmit a new understanding of your purpose as a teacher of light. If you choose to embark on this journey, do so with a sober intent and humble outlook, for you are entering a scalable relationship with the Divine Being that is your light body, and calling for its highest purpose to be invoked upon this planet of five kingdoms. You are entering an accelerated path of change, as this is what higher light energy brings: accelerated change begetting intelligent behaviors befitting a teacher of light. This section of Liminal Cosmogony, known as Teachers of Light, constitutes a curriculum of the light body. It is an owner’s manual for those who are embodied and desire to exercise their divine rights as a teacher of light; to share the mysterious gift of the higher light and intelligence of divine love to the planet and all upon her. Remember the writing is not so much contained in the words, but the feeling you receive from them as you contemplate their deeper meanings. May the initiatory coding of this paper awaken you to the next level of your journey. The light body is a particle of the Divine Mind, cast from the Central Sun into and through the fourth and fifth dimensional matrices in order to embody within a human being the essence of the Central Sun. The light body’s materialization begins from the seventh dimension, cascading into materiality where it settles into the first manifested being—the human heart. Within the human instrument, it is the heart that is originally the nucleus-home of the light body, but eventually the light body’s locus drifts upward to the pineal gland at the base of the brain, usually in the first seven years of life. Here it typically remains until the physical body expires, at which time it recirculates within the higher light realms of the fifth dimension wherein unity and the connective field of pure love radiates unimpeded by matter. This is the ground of soul where all beings flow in the vibrant river of sound and light. The light body is composed of the Light of the Central Sun. Within each of the galaxies is a Central Sun that acts as the transmitter of the Divine Mind within the galactic multiverse. The Central Sun is the trans-dimensional portal within each galaxy that interconnects all galaxies and dimensions of life therein to the pulsing heartbeat of the Grand Central Sun from whence the primacy of sound and light arise. It is the integrative nexus between the physical and spiritual planes, and thus, the Central Sun is the quantum sum of all suns within the galaxy, and this quantum light lives within the human instrument as its light body. In a very real sense, we are all born from this sound and light of the Grand Central Sun, and it is to this pulsing, rhythmic heartbeat that we are all entrained to varying degrees. It is this entrainment that re-establishes our alignment to the Grand Expansion and restores our access to the higher intelligence where we become the willing impulse of divine will. The light body is the seer of reality within the individual identity. It is the Wholeness Navigator that detects the frequencies of fifth dimensional essence in the lower dimensions of matter, time, and space. It is the bearer of alignment to the Plan of the One Creator. It is the portal of guidance within the one who is separated from unity by the veils of illusion. It is the voice within the void that calls to your mind and heart, beckoning its recognition and restoration as your true identity and that of all others as well. It is the connection between the heart and mind that allows for true creation to occur. It is the telepathic portal that hears and sees the divine intelligence and then activates its expression within the lower realms by mere presence. The light body is the core of consciousness, and this interior core is shifting. In your world it is shifting back to your heart, but its nucleus-home is now between the heart and throat, known as the thymus, or the “heart’s crown”. We will speak of it as the Rising Heart. The Rising Heart is located on two axes or fields of vibration: the first is the horizontal axis, which is the Field of Planets. The second is the vertical axis, which is the Field of Central Sun. On the planetary axis, there is the material being or human instrument, composed of the sheaths that protect and sustain the light body—the physical, emotional, and mental sheaths of the third and fourth dimensional matrix. This axis represents the planet meeting your light body. It is the axis of grounding and anchoring the light body to the planet and the physical beings upon her. 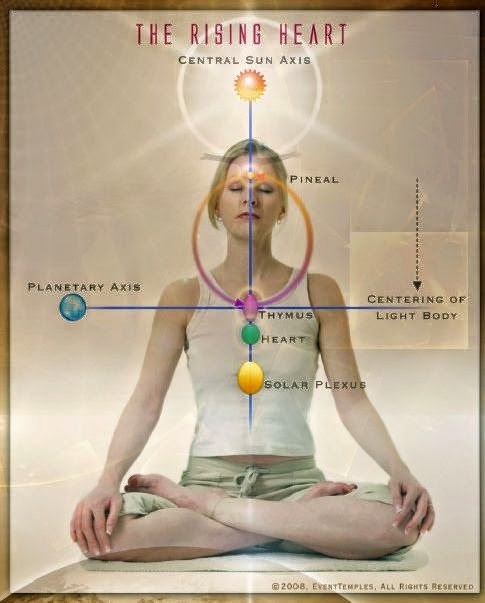 On the Central Sun axis there are the descending and ascending streams of energy that connect your light body to its source: the Central Sun. It is from this connection that the Grand Awakening of physical beings occurs and the divine current is felt tugging on your human instrument, calling it to activation and awakening its will to become a vehicle for the light body. The light body is the zygote of consciousness formed by the union of divine light and sound. It is born radiant, pure, intelligent and life-sustaining. The light body listens to both your thought-scape and feeling-scape, adjusting its radiance in accordance to its perceptions. Thus, the light body reacts to the lower dimensional matrix, and in this way is influenced by the individual’s level of coherence, intelligent expression, creative insight, and higher mind intuition. As the core of consciousness shifts to the new axis of the Rising Heart, the internal coherence of the individual becomes the amplifier of the light body’s radiance in the world of form. This internal coherence is heightened when the thought-scape and feeling-scape of the individual are aligned and flowing in the river of divine will. It is then that the light body can truly step forward and radiate its purpose on the planetary level. The radiant and intelligent expression of the light body enmasse is the true meaning of life in the planetary axis because it is the action of collective intelligence that enables the planned and unplanned evolutionary paths to converge and empower the planetary shifts that enable dimensional ascension for all who are prepared. This increase in the expression of light and love within the planetary sphere opens the Grand Portal, which is the gateway for the planet to access the fifth dimensional matrix of pure, connective energy, which is, in essence, divine love-intelligence. As the children of light begin to activate their light bodies while living within a human instrument, they will sense the presence of their electromagnetic field as it becomes enmeshed with their every breath. The breath washes over the Rising Heart in both the in-breath and out-breath. When breathing in, the energy symbolically descends from the Central Sun and flows through the crown chakra settling at the solar plexus just below the heart. There, it sparkles in the golden light of your signature tone. When breathing out, the energy is released from the solar plexus up to the planetary axis at the height of the thymus or Rising Heart, and then radiates outward with dominance to the horizontal plane. In this time of the Grand Awakening the light body is becoming centered at the Rising Heart because the mind—where it has been centered for thousands of years—is enmeshed in static and distortions that confound the light body’s ability to fully radiate its energetic field upon the planetary grid and fulfill its purpose. The intersection of the two axes (Planetary and Central Sun) is the activation point of the individual. The integration of breath and imagination is the most efficient method through which this activation can occur and be sustained within the human instrument. The breath of the Rising Heart is the practice of breathing from the Central Sun and expressing this breath energy into the planetary grid. It is the method of activation taught on all planets for those aligned to the Plan of Expansion into the Lands Unknown. When you read these words you will understand intuitively for you know well the mysterious purpose that stirs you awake and compels you to action. The breath of soul is directed by the light body whose seat of intelligence resides at the point of the Rising Heart. You can imagine this as a portal within the body that receives the electromagnetic field of light from the Central Sun through the in-breath, and directs it to the solar plexus; and on the out-breath, channels it across the planetary axis as a way of grounding the energy within the field of third dimensional beings. It is this grounding of the energy, directed by the light body, infused with the internal coherence of the human instrument that enables the human emotional field to build the collective heart and connected mind that enables the planet to step through higher dimensional barriers with relative ease and grace. This is a time of action, and the action is to activate your light body to its purposeful role within your human instrument, and to share its higher light frequencies to the human emotional field. This activity re-grids the collective heart and connective mind to the emerging culture of the one, unified planet moving in the upward spiral of the seven dimensional hypersphere in which all beings within its quantum and space-time presence are unified with the planet, and the planet with the Central Sun. In this future time, beings will be galactic citizens and they will commune with other inter-galactic citizens and see the universe as they now see the planet. Each of you embody the light of the Central Sun, and not only carry it with you, but purposefully radiate it through your actions of intelligent love and the virtuous heart. You are builders of this future time, and your actions will be acknowledged with its direct experience. The breath through the Rising Heart is an activator of your light body. Internal coherence within your human instrument is the sustaining and evolving force of this activation, independent of the travails that befall you or the human family. You can generate this internal coherence through the practice of breathing through the Rising Heart and expressing the radiant beauty of the higher light through the virtues of the heart, the intelligence of the higher mind, and the ascendant beauty of the spirit we all share. When the breath of soul radiates outward on the planetary axis of the individual, it takes on the signature field of that individual. This signature is like a “carrier wave” to the original signal from the Central Sun, and it is this carrier wave that is the key factor that enables the rays of the Central Sun to cut through the static and distortions of the planet’s electromagnetic fields. There are many competing currents and conflicts within the planetary realm before its entrance into the higher dimensions of the etheric plane. These currents pull you, push you, and deliver you to shores of indeterminacy and questionable value. There are light bodies cast in human instruments that are so darkened that they are like black holes in space, swallowing light in the gravity of their misguided ignorance. The light body is, in some ways, a fragile consciousness. It listens well and responds to what it hears. It sees the higher realities, but it also dives deep into the lowest realms seeking out the unique separation veils that empower its discernment, which ultimately reinstate its power as a sovereign integral of the highest order. The life of the light body is complex—more complex than you can imagine and yet you can appreciate its goals and the journey it weaves to achieve them because your intuition and imagination enable you to feel the edges of its reality. Those who are the Builders of the Grand Expansion are embodied in human instruments and they are awakening to their light bodies as their light bodies begin to activate to the new rays of light and love that are flowing from the Central Sun. We refer to these individuals as Builders because they are the architects and engineers who are building the new culture, monetary system, technology, and mind-body-spirit systems that will endure as the planet transforms itself to the new energetic grid of the higher fourth dimension. Within the Builders are the Planetary Teachers, and these are the ones who are now blossoming as the new rays embolden their light bodies to harmonize, resonate, and co-create with one another. There are saviors and messiahs that enter the planetary grid in its third dimensional and lower fourth dimensional state to periodically re-align the spiritual teachings of humanity to their Ancient Source. However, now is the time when the Teachers of Light are operating as a collective power, joining together to weave a new fabric of time, space and energy—one that is ultimately the portal to the fifth dimension. The Planetary Teachers are generally embodied, while the Central Sun Teachers are mostly operating in their light bodies on higher dimensions, and in some cases, other galaxies. The Planetary Teachers of Light require activation, internal coherence, a balanced inflow and outflow of love and light through a virtuous and heart-filled behavioral system, and the quiet of re-connection time to rejuvenate and re-balance their human instrument. The Rising Heart technique is a system to achieve each of these requirements. It is not the only way; it is a proven way. It is a framework that can be adapted and modified to suit an individual’s preferences of imagination and intuition. The Teachers of Light are quantum beings of great power. Though they wear human instruments of density and distortion, they never lose sight of their rightful purpose and the ultimate ascendancy of their family of light. The human instrument is a fabric of frustration for the Teachers of Light, as they know well what they are, but like a ballet dancer wearing a spacesuit, they are not able to express the fullness of their higher wisdom in the material worlds. This frustration is coupled to the third dimension construct that teachers must teach through words—spoken or written—and yet we tell you that it is through your behavioral system, the expression of your virtuous heart and the application of techniques like the Rising Heart that define you as a teacher of light. The writings of the Planetary Teachers are telepathically transmitted by the Central Sun teachers, who in turn translate the energetics of the Central Sun and step-down these higher energies into the vocabulary of the human family. This is the system of dispensation that prevails on all planets until the species achieves fifth dimensional equilibrium, at which time, the communication from the Central Sun is direct and immediate. The Central Sun, in essence, is opening the channels of telepathic communication to the Teachers of Light so they are able to transmit the vibratory energies to the general masses entrenched in the energetic quagmire of the previous and current dimensions. As planets ascend inter-dimensionally they require a higher connection to the Central Sun to draw them from their present dimensional grid into the next level, and this is precisely what the Central Sun Teachers instruct the Planetary Teachers to do: to facilitate this higher connection through various techniques that activate the light body of the Teachers of Light so they may collectively create this higher connection. When you inhale the light of the Central Sun, and take it into your soul’s workshop, adding your fingerprint of love for your brothers and sisters, and then release this higher light to them and your planet, you create this higher connection in this simple act. Not only for yourself, but for all. All of the human family benefits for we all rise on the same currents of divine love and the higher intelligence that pervades it. objective that runs deep throughout all of the materials, linking them in purpose. What follows are the primary content offerings from the Lyricus site. Major Lawsuits Filed in the Sandy Hook Hoax - Breaking News ! Attached is a photo staged by the Newtown Bee, a wider view of that action being staged on a different day that the emergency altogether, and a sampling of front pages that terrorized the world with the fake photo. Mr. Shanley is the producer of The Made-for-TV Election starring Martin Sheen that analyzed media coverage in the tectonic Carter-Reagan election of 1980. He is also the author of books on quantum physics, including Alice and the Quantum Cat (2011). Dr. James Fetzer, whose 35 articles on Sandy Hook for Veteran’s Todayqualify him for the highest investigative journalism awards, and School Safety Consultant, Wolfgang Halbig, whose investigative expertise as a former Florida State Police officer, and loving attention as a former principal, makes this case’s particulars comprehensible to all, will be called as expert witnesses. It is their scholarship and bravery that makes these Complaints possible for the shear breadth and scope and detail of evidence they have assembled. Hundreds of independent researchers have also made this day possible, and Mr. Shanley claims they will be tracked down and rewarded heartily for their bravery and mindfulness of America. A third lawsuit will be filed against Connecticut-based TV and print media soon. A complete list of Defendants in this suit can be found below. As Mr. Shanley is proceeding on a pro se en paupers basis, public support is welcome via PayPal to wbs2012@zoho.com. The Shops at Columbus Circle, 1 Time Warner Ctr. Hook was Staged? Absolute Proof Sandy Hook was Staged?